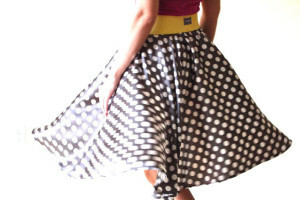 The circle skirt is one of the easiest items of clothing to sew, making it an ideal starter project for a beginner and great for anyone who wants to whip up a skirt in a hurry. The skirt is formed from a simple circular shape that flows with flare and is oh, so flattering. You can make it any length – mini, maxi, or in between. Even then, the hem doesn't need to be all the same length, and you can be creative about making zigzag, layered or other unusual finishes for the hem. This free tutorial is great because it's takes you step by step, and best of all has made the math part of this pattern super easy with measurements for both girls and adult sizes.